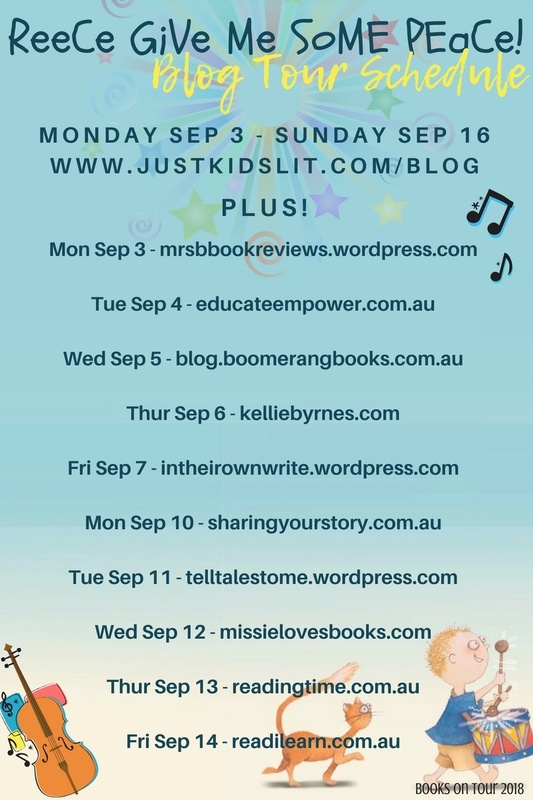 Today author and speech pathologist Sonia Bestulic is stopping by my blog as part of her current Books on Tour blog tour. 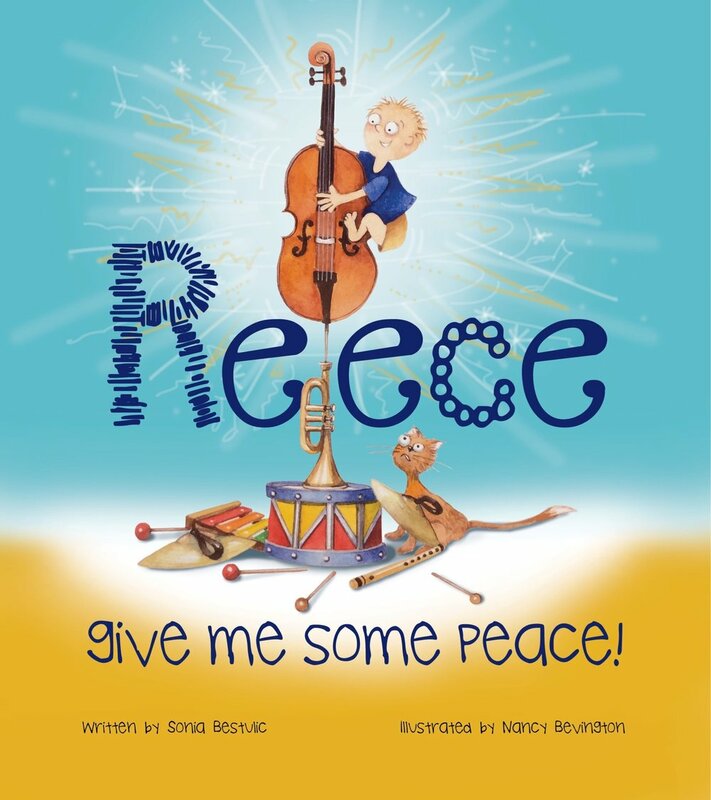 Sonia is launching her debut picture book, Reece Give Me Some Peace!, which is illustrated by Nancy Bevington and published by Big Sky Publishing. Reece Give Me Some Peace! is a rhyming picture-book story that introduces young children to a wide variety of musical instruments, including a flute, xylophone, violin, cymbals, drums, a trumpet, and cello. 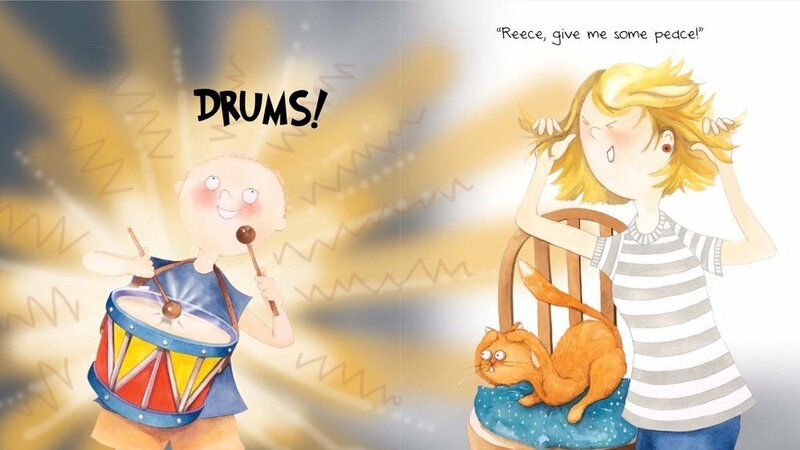 Reece, the title character, is a young child who is having all sorts of fun making music - and a lot of noise! - as he engages in creative play. His mother is not so impressed by the racket though, and keeps asking for some peace to be restored. In the story, there is quite a bit of repetition, which adds to its rhythm. Little ones will be able to follow along and sing out lines of the book quite quickly, and no doubt will be giggling with glee as Reece continues to test out every instrument, regardless of his mother's pleas. The lively, emotive illustrations, created by talented illustrator Nancy Bevington, really add a huge amount to this book. (Bevington was the co-developer of the popular Zen Tails series, and has worked on many other books, in addition to having an artistic career in the area of painting.) I love how bright colours are used from start to finish, which suits the mayhem going on in the story. There is real humour added in each spread, too. Keep a look out for the family's cat that makes an appearance throughout, and which had me smiling! Reece Give Me Some Peace! invites us to share in a day of active play with cheeky Reece, who loves exploring the musical instruments in his environment. Inevitably this results in his mother not enjoying too much peace in the process, but hey, Reece is certainly enjoying himself! The musically noisy scenario of Reece and his mother is one many parents can relate to no doubt! Reece Give Me Some Peace! has a musical theme reflecting my musically entwined childhood, having played the violin well into my late teens. I certainly appreciate the joys that come with playing an instrument. The book also encompasses the theme that kids learn through play and exploration; highlighting the importance of unstructured play to allow children to use their imaginations and choose how they interact with objects and the environment. Reece certainly reminds us of the joy and learning that comes with play! The inspiration was drawn from the period of my life I was in with my three young children being 2, 3 and 4 years old at the time! Life was certainly hectic, and there was always activity happening! Having three children so close in age brought with it a strong reminder to live in the moment and be playful. Reece Give Me Some Peace! reflects that, as well as the difficulties parents often experience, in trying to enjoy moments of peace and quiet in a noisy child-inhabited household! The story did not change much as I was writing it. The concept and the dynamics of it came to me as a whole quite clearly, and it was a lot of fun to write. Readers will gain an all-encompassing auditory experience, with the text intentionally providing strong rhythm, repetition, alliteration and rhyming - important features that contribute to getting children ready to read and spell. Readers will also gain a lovely visual experience, being introduced to a variety of instruments, some of which will be new to them. It is a playful interactive book that children can have a lot of fun joining in with. I envisage strong connections, with children relating to Reece, and parents relating to Reece’s mother. Overall the book creates a lovely dynamic book-sharing experience that will certainly reinforce the take-away message to keep learning through play and remember to live in the moment a little more! Biggest challenges in writing this story or in getting it published? Like many other aspiring authors out there, it is a challenge for your voice to be heard in such a busy and competitive industry. It also takes some perseverance and patience in getting to know and understand how the industry works. The publishing process of putting Reece Give Me Some Peace! together was certainly a smooth one. Big Sky Publishing was great at liaising between myself and Nancy Bevington, the illustrator; essentially facilitating the process. I answered a number of questions, to formulate a brief for Nancy to work from, and this gave her a basis to start putting the initial sketches together. The publishers sent through the illustrations at various stages for thoughts and feedback; and this was from the initial pencil sketches of the characters, to more detailed pencil sketches, and then eventually the coloured illustrations of the first few pages etc. Nancy pretty much nailed the brief from the outset, so it made for a smooth process. I do like to brainstorm and jot down creative ideas when I am out and about; observing people, places and nature; however the bulk of my writing is done during quiet times at home. In terms of particular rituals – I do enjoy writing accompanied by a hot beverage like a herbal tea or an almond milk turmeric latte; together with something sweet or a few squares of super dark chocolate! Books and writing have always been an integral part of my life since early childhood, I loved the experience of new worlds books immersed me into, as well as the joys of sharing books that were read to me. Since childhood I have relished in writing in its various formats, and always had a particular passion for rhyming and the creative fun you could have with language. Keep writing, keep reading, get involved in writers events and engage in writers groups online and in person, get feedback on your writing, and persevere with your submissions! The Cat in the Hat (Dr Seuss); Where is the Green Sheep? (Mem Fox); Gruffalo’s Child (Julia Donaldson). Favourite book character would have to be the quirky Cat in the Hat.